An impromptu documentary capturing Israeli soldiers’ threats of violence, by Harry Fear. Dedicated to the sufferers of constant harassment under Israeli occupation in the West Bank of Palestine. CHEMTRAIL FILM: What in the World Are They Spraying? Here is the story of a rapidly developing industry called geo-engineering, driven by scientists, corporations, and governments intent on changing global climate, controlling the weather, and altering the chemical composition of soil and water — all supposedly for the betterment of mankind. Although officials insist that these programs are only in the discussion phase, evidence is abundant that they have been underway since about 1990 — and the effect has been devastating to crops, wildlife, and human health. We are being sprayed with toxic substances without our consent and, to add insult to injury, they are lying to us about it. Watch this stunning documentary – as this film crew gets exclusive access to the most isolated country in Africa, which has been victorious in recent wars against not one but two superpowers. Visits to the key historical sites of a nation with a 1,200 km Red Sea coastline across from Yemen and Saudi Arabia, and talking to stakeholders about massive infrastructural investment in a nation, currently the subject of UN Sanctions. Eritrea has defied Western neoliberal economic, political and cultural agendas and our cameras record the self-sufficiency experiment that has made Eritrea one of the fastest — if not the fastest — growing economy on the planet. Presenter Afshin Rattansi examines the complex issues that are at stake for Eritrea in its battle against U.S. hegemony — from its diverse religious heritage, the rebuilding of its health, education and urban/rural infrastructure to its cautious implementation of foreign investment strategy. Will the ‘Star Wars’ narrative change now that Disney has bought LucasFilm? The unexpected news of Disney acquiring Lucasfilm and the plans to continue Star Wars are worth some consideration. The Atlantic’s Spencer Kornhaber is right, of course—the saga will survive “whatever horrible thing Disney does to it.” But the timing of a new film, presently set for release in 2015, has implications beyond the state of CGI and digital projection. This isn’t just another Star Wars film; it’s Episode VII, which means we are set for the continuation of a story that ended in 1983. And life in the galaxy following the Return of the Jedi will have an interesting parallel with our world post-War on Terror. I’m not sure I really believe Lucas on either assertion. It seems more likely that he wants to be known for having strong political beliefs and for creating art with a resonance beyond Taco Bell cups. Empire-as-America is the most convenient trope, though it’s not really reflected on screen but for one ham-fisted “with us or against us” line in Episode III. Though the world really was enduring a hard grind during much of the prequel trilogy’s run, the films themselves never escaped a certain plastic gloss. They were hardly an escape because they were essentially about a war, but the war depicted was so inauthentic that audiences never latched on. Perhaps (in addition to so much else) the poor reception of the prequel trilogy can be attributed to a simple disconnect between events on the screen and events outside. They really did feel like something a long time ago, but not in the way anyone wanted. 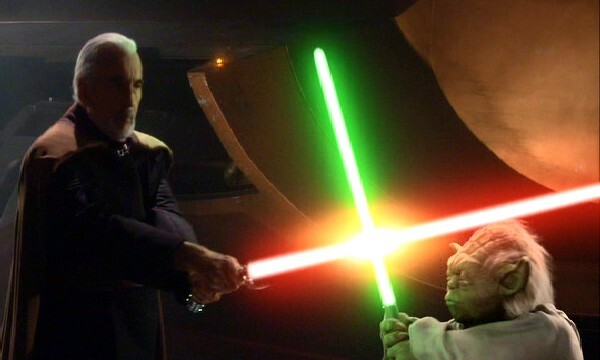 Count Dooku and Yoda dueling in a spiritual war in a galaxy far far away. There is a direct comparison with the Lord of the Rings trilogy, whose first film premiered three months after 9/11. That trilogy found success in no small measure because it worked as a prism through which Western audiences could evaluate their newly fragile world. (The second part was even called The Two Towers.) Yes, principal photography had wrapped in 2000, and the novels were first published in the 1950s. But in theaters, audiences were imbuing the films with meaning and finding favorable comparison with events of the day. Here we had a nebulous evil thrust upon an unsuspecting group, and a consequent hard task and eventual obliteration of innocence. Sometimes the evil caused otherwise good people to do terrible things. And the world as masterfully portrayed by Peter Jackson was cold and challenging. The Lord of the Rings was dark, unrelenting, and very serious. None of those things can really be said of Star Wars, whatever Lucas wants us to believe. Not for a moment would any clear minded moviegoer point to a screening of Attack of the Clones and say, “Geonosis is just like Afghanistan!” Rather, the prequels told a perfect story for the 1990s, when war was pretty much entirely bracketed by the imaginations of filmmakers. Obviously Lucas couldn’t have foreseen the catastrophe about to engulf the planet, and so his story derailed. Later planning and regrouping wouldn’t necessarily have helped—Lord of the Rings, certainly, would have been diminished had it been conceived and filmed as a statement on the War on Terror. The prequel story was simply incongruous to the times, however it was retrofitted. With Episode VII, however, the disconnect may be righted. Already, we have a good idea of what the world post-War on Terror will look like. In lieu of big military offenses or visible progress, we have sanitized drone wars and covert actions. Gone is a monolithic enemy—that’s been replaced by al-Qaeda, personified by Osama bin Laden. Here to stay are scores of loosely affiliated and undefined groups, each with its own goal. The horror in Benghazi might be a one-off, but it might also be a glimpse at the new normal. Gone is a president whose first act in office was directing the closure of Guantanamo; here to stay, whoever wins in November, are secret kill lists and four-part tests to decide when it’s okay to assassinate American citizens. Watch as London resident with heart condition is violently assaulted by a gang of private ‘Community Police Officers’, and then evicted, a brutal act planned and carried out by the TMO – a local PPP/PPI private administrative corporation disguised as a government agency in Kensington and Chelsea, London – all caught on camera. Police footage courtesy of Kensington and Chelsea residents.